So that day, no immediate changes noted, however nearly two months later, in early June 2007, I took Peaches back to the DVM where she had received the Rabies vaccination because she had developed bi-lateral (one on both ears) wedge shaped ear (pinnae) sores. The doctor dismissed me with an antifungal, antibacterial, antibiotic cream. Peaches competed successfully in Agility through the summer of 2007. She appeared to feel well but the ear lesions remained. During this period, Peaches developed a strange round yellowish skin/fur color change on her right rear haunch. Even the texture of the fur over that area became changed…Silkier feeling, but with a yellowish cast in her otherwise white fur. I had her back again to her regular vet during the summer, but still they could not explain the pinnae sores, neither could they now explain the hair color change…and so we continued competing thru the summer. I used the cream which seemed to help a little. I began attributing the color change to all of her swimming in the pool, much like blondes whose hair color would change due to the chemicals in swimming pools. Little did I know what journey we were in for. 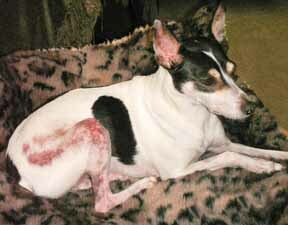 In October of 2007, Peaches entire right rear leg (and gradually her belly) became very edematous (swollen). She was taken to many specialists. Peaches had blood-work, ultrasounds, x-rays, MRI’s, lymph node aspirates, lymph node biopsies, skin biopsies, etc. Then after all this, the DVM’s stated they could find nothing wrong with her. They decided to manage her symptoms with high doses of steroids. My poor little girl, it was heartbreaking to see her suffering from the ill effects of both the drugs and the disease. I spent many late winter nights crying filled with the sadness that I was going to lose my Peach, and the frustration of KNOWING there was something wrong and I had to get to the bottom of it. As I got back into the car with Peaches I called the local vet who had given her Rabies booster, and asked that question. I received the name of the vaccine manufacturer, lot number of the vaccine, date it was given, and where it was given..it was given in the right rear haunch where the color change had occurred! That night I went home and began my research on “Google U”, putting in all the symptoms along with the term “vaccination”. My husband, an M.D. was shocked and amazed at the Clinical Studies I pulled up on the net that pointed to exactly the symptoms and disease process that Peaches was experiencing. What I found was a disease written about by well known academic Veterinary DVM’s and labeled “Rabies Vaccine associated Ischemic Dermatopathy”. (I called the vaccine manufacturer and gave them all the details and they asked me to send them all reports which I dutifully did for months until the diagnosis was finally made). We asked the Board Certified Internist and the Board Certified Dermatologist to please make an appointment with Dr. Daniel Morris DVM ACVD at the University of Pennsylvania, as he was one of the authors of one of the many case studies on this autoimmune disease I had pulled up on Google. We waited 2 weeks without our Specialty DVM calling Dr. Morris. It felt like an eternity with Peaches so sick. I kept calling and asking our Internist to please call and make an appointment for Peaches with Dr. Morris. Nothing. Again, Why? Why was this so hard when we had the clinical studies and documents in our hands that directly pointed to what was wrong with Peaches and the name of the right Doctor to go and see? Why wouldn’t they make the appointment for us? I needed to make Peaches better. I needed someone on my side and that would help her. I was so frustrated and sad. Then sensing where I was at emotionally, enter my husband and hero, Marty Schor, M.D. Marty got on the phone, and less than one week later we were in Dr. Morris’s office at the Matthew J. Ryan Small Animal Hospital at the University of Pennsylvania. Oh my, how simple! And what a relief to have been finally validated! Peaches “official” diagnosis by Dr. Morris finally occurred in early March of 2008 and by that time had cost us approximately $12K to obtain once we added all the tests and DVM visits up. Finally Peaches was put on the proper meds. She went into complete remission fairly quickly, and was able to compete for 2 trials in October, one year after she became critically ill. I treasured every moment of running with her again. As my friends who are here know, I cried with happiness at the end of each run. Peaches was off all her meds for 3 and a half weeks when symptoms began to reappear with a vengeance. And now she is on meds again and we are trying to keep this awful disease at bay. I am hopeful Peaches will stabilize once again and remain healthy. I treasure every moment with her and her “fur-sisters”! Peaches is fed a home cooked diet now, sautéed meats and I add Honest Kitchen Force (grain free formula). I make up a 3 day food supply at a time and put it into a Pyrex dish in the fridge. She gets only healthy whole protein sources mixed in, no kibble or processed food, and I think it has made a huge difference. I also add into her weekly diet hard boiled eggs, salmon, tuna. She eats well! Peaches is also on 200 mgs of Pentoxyphylline (prescribed med) twice a day. She is now in remission and doing very well. I am very hopeful we will be discontinuing the above med in the next few months! Thank you for writing about your experience with this disease and for supporting the Rabies Challenge Fund. I, too, have a dog who has been severely affected by this disease and am glad to see that people are spreading the word about the dangers associated with this vaccine. My dog, Louie, also has a serious intestinal disease called lymphangiectasia which came on at about the same time, and came very close to taking his life. I have no idea whether there is a relationship between this disease and the vaccination reaction, and feel that much more research is needed in this area. Louie’s story can be seen on my blog at http://savelouie.blogspot.com . The blog was originally started to address an emergency dietary need when the manufacturer of his prescription diet stopped making the formula, and I am now working to help spread the word about intestinal lymphangiectasia and will be adding more information about rabies induced ischemic dermatopathy there, as well. Again, thanks for telling your story, and I hope Peaches is feeling well these days! Hi Laura. I’m sorry for Louie’s problems. I can truly empathize. Thank you for telling your story. I had my cat vacinated two months ago. 2 weeks ago she developed a large abscess in this area. We took her to the local vet and they washed out the area and put her on antibiotics and steroids. Today we took her back to the vet because the area has become very hard and is still oozing. The vet is sending a biospy out to see if they can find out what is causing this. I wish I would have known the dangers of vacinations ahead of time. Pam, good luck with your cat’s test. If you want more information on vaccinating cats, see http://www.littlebigcat.com and http://www.catshots.com. There’s alot of information about vaccination at http://www.dogs4dogs.com/blog/category/vaccination It’s directly towards vaccinating dogs but most of it also applies to cats. Can you please tell me what meds Peaches takes? My beloved border collie mix, Bear, has severe ischemic dermatopathy due to a vaccination she received in 2006. She was a gorgeous healthy girl at the time of her vaccination. The disease has progressed and the seemed to go into remission a few times, only to come back again with a vengeance and she seems to be rapidly declining the last two months. Her paw pads are badly ulcerated and bleed every time she goes outside. She has had significant necrotizing of the skin on her “elbows” and her sweet little face. She has lost fur in straight line down her neck and in patches on her chest and belly. She has lost so much muscle mass around her face, one of her eyes “droops” open. Much of the hair along her snout and around her eyes is gone, and the skin is crusty and scarred. She can no longer be walked on the side walk, or lay in the snow like she used to love. We have a 4-month old puppy that she play with, but an accidental scratch from the puppy on Bear’s face cut her delicate, fur-less skin. I am completely heartbroken and don’t know what to do. I fear we will lose her soon if this continues to progress. I have switched to a wonderful new vet, and would be so grateful for any information I can bring to him. I am heartened by Peaches story and inspired by your persistence to find the correct treatment protocol to help her recover – thank you! Hi Lisa. I’m so sorry for your dog’s problems. I sent your comments to Judy, Peaches’s “mom.” I’m sure she’ll get back to you. If she doesn’t in a few days, she may be out of town. Let me know and I’ll try to find the information another way. Hello. I am interested in finding out more about the community of people dealing with this problem with their dogs, and what treatment options are available. I have a 8 year old pointer mix with severe behavior problems who is on a variety of behavioral medications, and has been for about 2 years. 6 months ago, she developed a lesion below her right eye, looking like a boil or a burn. It does not respond to any topical treatment we have tried. Due to her mix of meds, we are extremely reluctant to try steroids. A February biopsy indicated probably ischemic dermatopathy, however, we are doubtful this is vaccine related, but rather suspect it is stress/immune mediated, possibly result of the drugs she is on. All other laboratory testing is normal; we do regular bloodwork including thyroid panel. We are concerned as the lesion appears to be spreading, and are troubled that the source of the problem cannot be determined. If there is any information at all anyone could point me toward (as beyond a few veterinary journal articles and so on, there is not much reliable information out there), specifically, if there may be any natural treatment options available. we would be very much thankful. Christina, I’m sorry to take so long to respond. Your question about your dog’s I.D. and behavior problems came right before my Safe Pet Vaccination Seminar. I was swamped. I just found your posting at http://www.blog4dogs.com. If I were you, I’d contact a vet certified in homeopathy. There are referral lists at http://www.dogs4dogs.com/vet. I know you think vaccines aren’t an issue, but both I.E. and behavior changes can be caused by a rabies vaccine. Homeopathy is the best remedy. I hope things have improved since you wrote. thank you, Jan, for all of this info & for sharing Judy’s & Peach’s story. I have a 3 year old mini Schnauzer “Lil” who may have this disease. She has lesions on the inside & about midway down on both ears, which come & go for no apparent reason. Have done different antibiotics (both topical & oral), natural stuff, biopsies, etc, with a possible diagnosis of some sort of “auto-immune related” vasculitis. I am thinking it is rabies vax induced vasculitis, after much research, & especially after seeing your info here. Will Judy share her regiment of meds, diet, etc with me? I would be so grateful!! I am just so devastated to think that this might not be curable :-(. Anyway, any more info that I could obtain would be so appreciated – my little “Lil” is one of 4 Schnauzer daughters here, & they are my world!! I am interested in contacting Judy Schor and asking more questions about her dog, Peaches. My dog also has been diagnosed with an auto-immune disease, cutaneous vasculitis, as a reaction to her rabies vaccine. I am feeling quite lost and having a really hard time getting information about what precisely to do in regards to treatment. She is on medication right now, but I still have concerns/ questions. My puppy got a hold of one of those rabies packets the county drops for raccoons. The vet’s not in it’s sunday. Does anyone know if these things are harmful to my dogs?I will go to the vet first thing in the morning just wondering if anyone knows. My older female has been sick with hair loss patches that resemble the dog in the pictures, the vet has had her on steroids and antibiotics she never gets better. I’m so worried. Reading Judy Schor’s situation, it brought me back to my dog’s situation, Daisy, and how we had to put her down September 26, 2015. On May 15, 2015, she had the 3 year rabies vaccine manufactured by Merck. I started looking up symptoms of canine rabies vaccine and found this site. Daisy got rear leg partial paralysis, bruising, blisters, scabs on her front elbows, runny nose, lethargy, and finally the front legs stopped working. She was put on steroids, antibiotics, non-steroidal treatment, and on Saturday, 9/26/15, she could not walk. She had a bloated stomach in which the Vet diagnosed her as Degenerative Mylopathy, but the vet at Ohio State stated that her symptoms are probably related to her 5/15/15 rabies vaccine. She was a 7 pound Toy Poodle, just barely 8 years old, when we put her down. Her last week, she got lumps on her chest and a pus filled sac on her neck. It hurst like hell to put her down and I suspected a week after the rabies vaccine that her symptoms were caused by the shot, but the vet insisted that it was some sort of virus. My 2yr. old Shih Tzu Nena is another victim of this vaccine. Two weeks ago we took her to the vet for the yearly vacations and the doc. Gave here the rabies vaccine. The following days she was sick with diarrhea, vomit and now she has a nasty rash all over her body. I wish I had informed myself better before doing this. The worst of all is that it is a city code punish with a $500 fine and no one accept the responsibility for the upcoming doctors bills l’ll have to pay to help Nena with the treatment to get her get well.